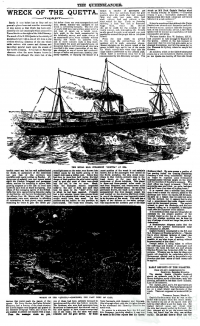 When the steamship Quetta was wrecked on a reef in the Torres Strait in 1890 with 134 lives lost, repercussions of the disaster were felt in every embarkation port down the Queensland coast. In 1890 journalist Archibald Meston described the sea journey of 1430 miles from Brisbane to Thursday Island. 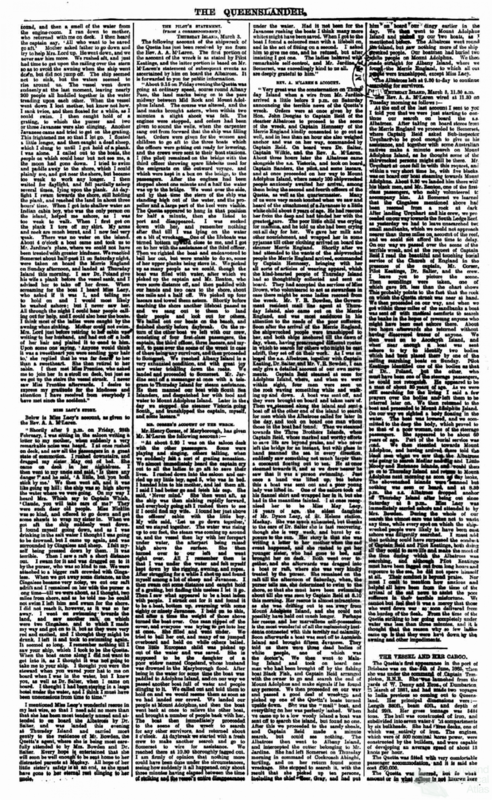 It was, he wrote, ‘a glorious pleasure trip in fine weather, which is nearly certain for nine months in the year’ and added that any tourist travelling the route ‘has the satisfaction of knowing that the risk of disaster is not worth a moment's consideration’ [italics in original]. 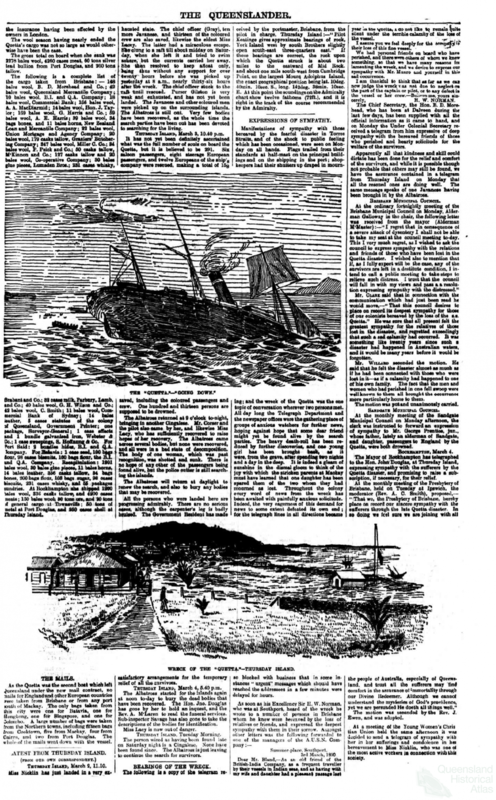 In 1890, the year that Meston's guidebook was published, the worst maritime disaster in Queensland's history claimed 134 lives. 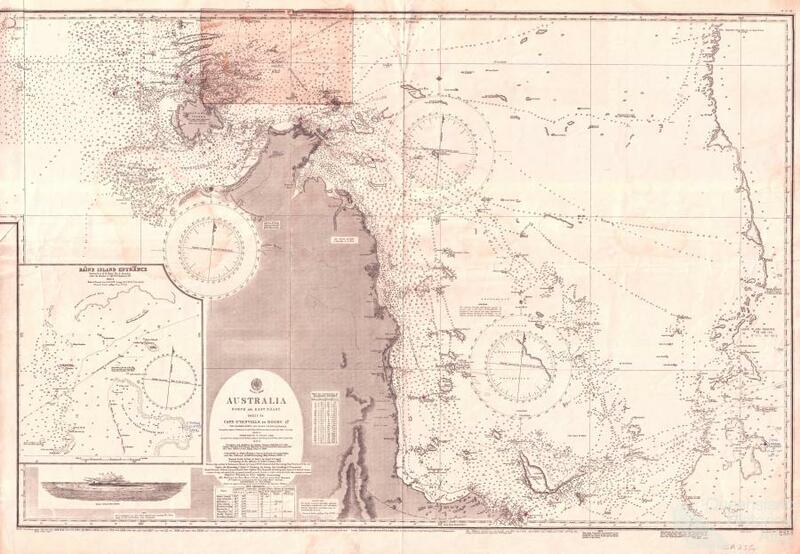 The Quetta, an iron steamship, struck an uncharted reef and sank in the Torres Strait. On 6 February 1890, 60 passengers boarded the Quetta in Brisbane bound for London, Batavia or Colombo. As it made its way up the Queensland coast, others embarked at Maryborough, Rockhampton, Mackay, Townsville, Port Douglas and Cooktown. At Mourilyan, 66 Javanese got on; they had been brought to the area to work in the sugar cane industry and were returning to Batavia. 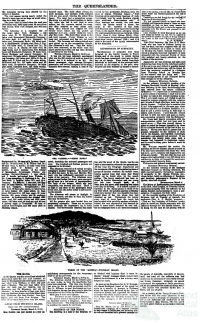 At Townsville four men tried to stow aboard when they discovered the steerage section was full. The passengers were a diverse and well travelled group. Many had been born in England, one in Norway and one in India. Their occupations included an artist, a globetrotter, a geologist, surveyor, watchmaker, wood engraver and even a cricketer. Prominent Queenslanders on board included Alexander Archer, manager of the Bank of New South Wales in Brisbane and brother of Queensland's Agent General in London, Captain Whish, Queensland Inspector of Road Surveys, businessmen Reuben Nicklin and John Watson, and George Prentice, the first mayor of Sandgate. There were 34 women and 30 children. 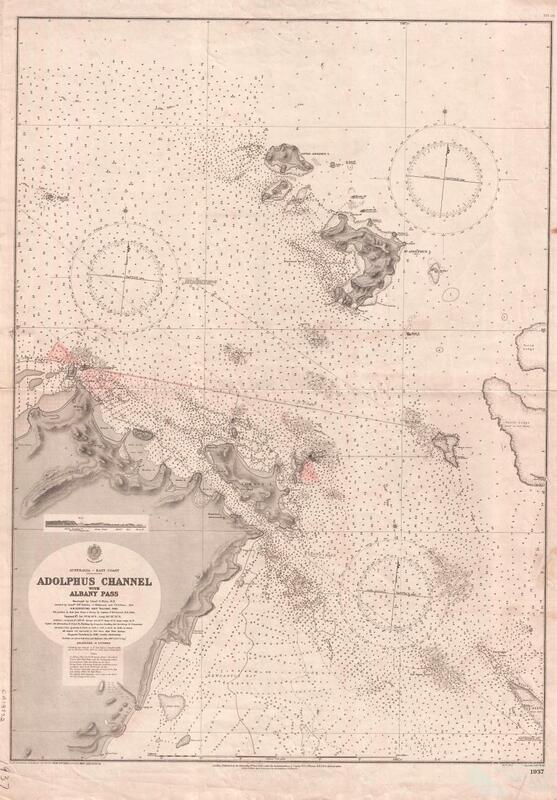 On 28 February 1890 at 9.14 pm the ship struck an uncharted reef at low tide in the Adolphus Channel in the Torres Strait. Many of the passengers were in their cabins and within five minutes of the collision the ship had sunk. Chaos ensued. Although there were three lifeboats and four other vessels, these were quickly swamped by frantic survivors. People grabbed whatever flotsam they could find. Alice Nicklin clung to a dead sheep until a wooden hatch board floated past and she held onto that. Captain Saunders, in a lifeboat, and Second Officer James Scott in a cutter, picked up survivors and reached Mount Adolphus Island. Scott continued searching for two hours. 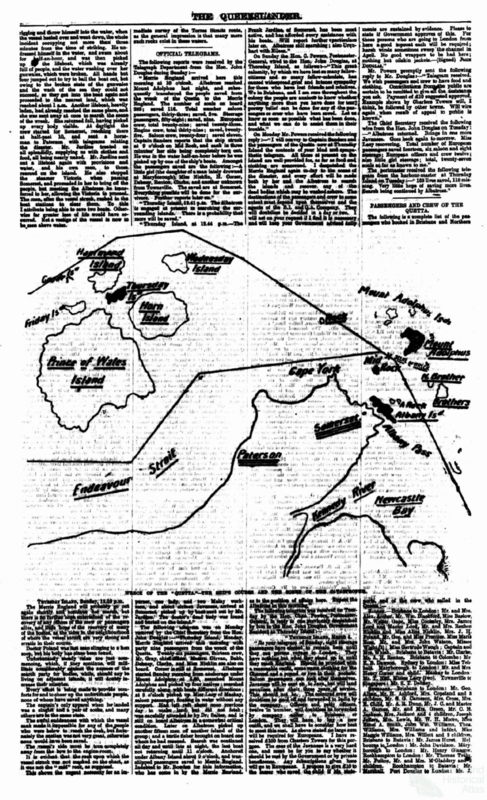 The next day Captain Saunders took the cutter across the channel to Somerset on the mainland where settler Frank Jardine telegraphed Thursday Island for help. Some survivors – such as 16 year old Emily Lacy who was travelling with her sister to a finishing school in London, remained in the water for 36 hours. 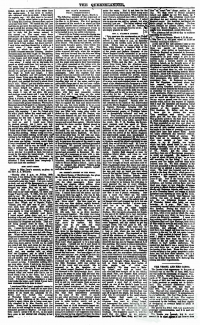 Although news reached Brisbane on 2 March 1890, it was some time before it became clear who had survived. Half the European crew survived, no doubt because they were more likely to be on deck when the ship foundered. Many of the Javanese deck passengers also survived but only 15 of the 100 saloon and steerage passengers did. With passengers embarking at every port along the Queensland coast, the tragedy affected all parts of Queensland. 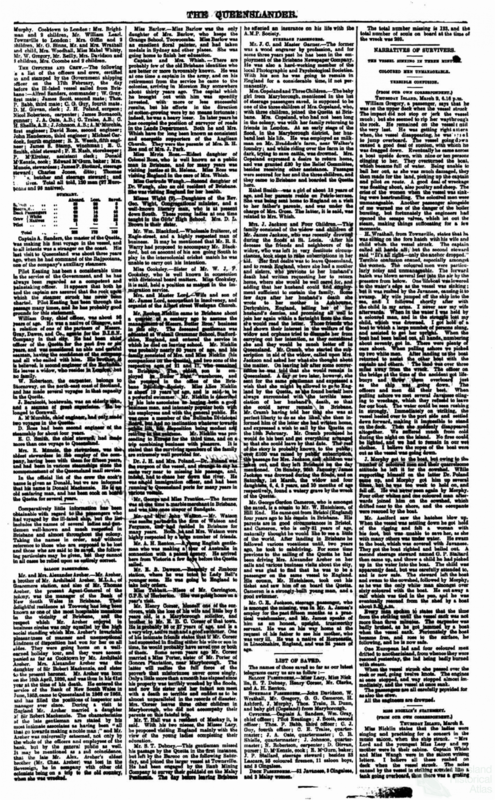 A Board of Inquiry exonerated Captain Saunders and his crew, but anger remained that so many crew survived while so many passengers did not. Many prominent Queenslanders and their families died in the shipwreck of the Quetta including George Prentice and his granddaughter Jessie, printer John Watson died with his wife. The shipwreck of the Quetta became part of folklore, and many stories and myths persisted. Writer John Foley later remarked ‘the wreck of the Quetta remains so memorable to Queenslanders because it was, essentially and above all else, a wholly Queensland tragedy'. The All Souls Quetta Memorial Church was built in 1893 on Thursday Island in memory of the lives lost.